All writers, bloggers experience a block occasionally. Whenever I have a bloggers block, I just find it difficult to even write one meaningful sentence. Yet I know I need to get the recipe on the blog to keep my followers interested. You may say but there are so many things or topics one can write about. True, but sometimes the idea is in the head but the hand will not assist in typing out the words. Many have suggestions like keeping a paper and pencil nearby to jot down any ideas or thoughts you may have. But that may not be convenient especially when you are busy.The other advise is to follow a theme so writing becomes easier. Making posts more interesting becomes like a full time job, hunting for quotes or opinions, taking photos, doing research, etc. When blogging, especially when you have great ideas flowing, its best to pick a quiet spot to work. Distractions may hinder your flow of thoughts. However, with family, hubby and chores to take care of, we all try to multi – task. Its also important to blog regularly to keep the thoughts flowing. Long breaks can make you a bit lazy. Finally, followers and readers opinions matter a lot. Encouraging words, tips to improve, or an opinion expressed all help us to improve. Coming to today’s recipe, we still are experiencing really hot weather so paletas or popiscles are the most obvious choice of dessert. This time round I made mango and coconut paletas. I love the layered effect. Coconut and mango is a delectable combination. Do you experience bloggers block? What do you do? Put the mango chunks in a liquidizer jug with the milk. Process till you get a smooth puree. Strain the puree to remove any fibres. Add sugar, cream, cardamom powder and lemon juice to the puree. Mix it well. Mix coconut milk, cream, sugar and vanilla essence. Pour about 2 tbsp of mango puree into each popsicle mould. Freeze it in the freezer for 10 -15 minutes. Add 1 tbsp coconut mixture. Freeze for 10 minutes. Add 1 tbsp of mango puree. Insert sticks now if required. Freeze for 10 -15 minutes. Add remaining coconut mixture and freeze the paletas for 4-5 hours. To serve, dip the moulds in warm water. Remove the paleta and serve. Add orange juice instead of milk to puree the mango chunks. 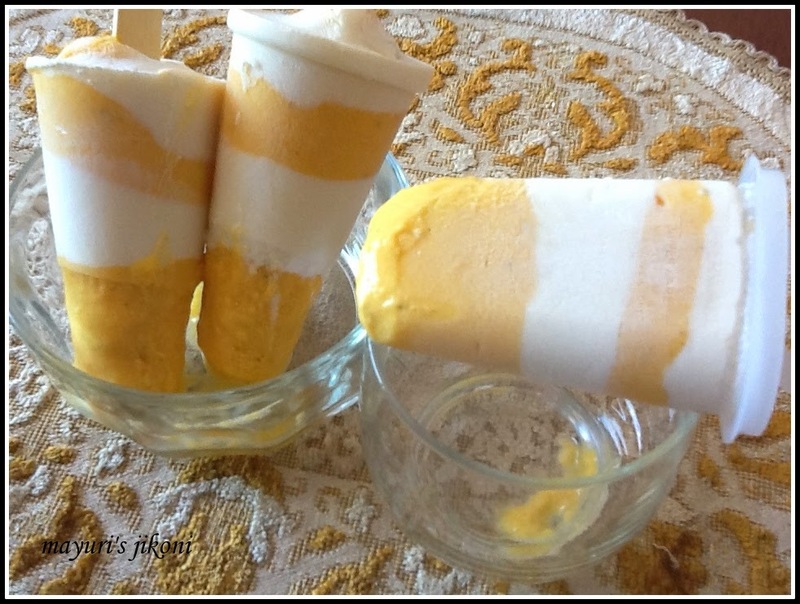 If you do not have any popsicle moulds, you can use either old yogurt pots or a kulfi mould. Insert the sticks when you add the 3rd layer. Make slits on aluminium foil pieces to allow the sticks to come through. Cover the pots or kulfi moulds with the aluminium foil pieces. I used canned coconut milk as its much thicker than the homemade one. Adjust the amount of sugar used according to your taste and on how sweet the mangoes are. Use greek yogurt instead of fresh cream. I cant even write two lines nicely, so just leave it and go with recipe, i am no story teller so its ok, this looks delish. Lovely combination of mango and coconut.. Yummy!! Loving this combination, looks so pretty and tempting..